Published: June 19, 2013 at 06:28 p.m. Updated: June 19, 2013 at 07:59 p.m.
"NFL Total Access" has launched its "32 in 32" series, breaking down the biggest subplots of every NFL team as the 2013 season approaches. Around The League will follow along and offer our own take. Up next: The Miami Dolphins. 1. Ryan Tannehill's 2012 statistics might pale in comparison to fellow rookies Andrew Luck, Robert Griffin III and Russell Wilson, but Around The League's Gregg Rosenthal has seen enough potential for his own personal Johnny Unitas. 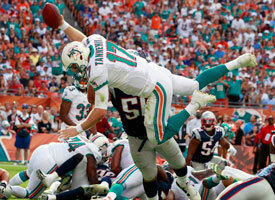 Offensive coordinator Mike Sherman "promises" Tannehill will be the most improved NFL quarterback from Year 1 to Year 2. Free-agent acquisition Mike Wallace arguably is the most dangerous deep threat in the NFL, forcing defenses to shift extra coverage in his direction. Add in catch-first tight end Dustin Keller and third wide receiver Brandon Gibson, and Tannehill's weaponry goes from one of the league's worst to above average. Tannehill's biggest leaps must come in third-down efficiency (lowest among NFL starters) and graduating to full progressions after leaning too heavily on his first read as a rookie. 2. The other primary beneficiary of Wallace's presence will be Lamar Miller, who is primed for a breakout in the featured back role. With Wallace drawing a safety away, Miller won't face as many stacked boxes. Since the end of last season, beat writers consistently have noted the coaching staff's "quiet confidence" that Miller is up to the task of replacing Reggie Bush -- and perhaps exceeding his production. 3. Don't sleep on the defense, which quietly finished seventh in the NFL last season and sixth in 2011. To that already solid unit, the Dolphins added No. 3 overall pick Dion Jordan, veteran linebackers Dannell Ellerbe and Philip Wheeler and cornerback Brent Grimes. If Jordan can provide a pass-rushing presence opposite first-team All-Pro Cameron Wake, Kevin Coyle's defense will join the Seattle Seahawks, San Francisco 49ers, Pittsburgh Steelers, Denver Broncos, Cincinnati Bengals and Houston Texans in the discussion of the best in the NFL. 4. General manager Jeff Ireland's shopping spree left his team with few glaring holes entering training camp. If there's one position that has to unsettle the Dolphins, though, it's left tackle. Playing 11 games on the right side and five on the left as a rookie, Jonathan Martin allowed more quarterback hurries (47) than any player in the NFL last season. Although the Dolphins are "very optimistic" about Martin safeguarding Tannehill's blindside, their pursuit of Branden Albert and reported interest in Lane Johnson suggested otherwise. Our takeaway: Free-agent binges rarely translate to success in the win-loss department. On paper, the Dolphins certainly appear to have upgraded on offense as well as defense. But their playoff hopes still hinge on Tannehill meeting his promise and Martin staving off a domino effect on the offensive line.